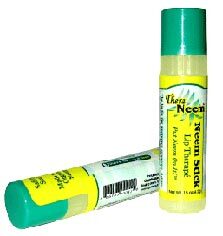 TheraNeem Neem Stick/Lip Therape, 0.15oz (Organix South) - Penn Herb Co. Ltd.
Neem oil is especially gentle and nourishing when used for sensitive or dry skin conditions. TheraNeem™ Neem Stick is a soothing antioxidant-rich formula to soothe and nourish sore, dry lips. Contains organic Neem. Organic Coconut Oil, Organic Beeswax, Organic Jojoba Oil, Shea Butter, Essential Oil of Peppermint, Sesame Oil, Organic Neem Oil, Supercritical CO2 Neem Extract, Vitamin E (Tocopherol). The lip fix for emergency situations. Actives in Neem are known to soothe and nourish. Where else can you use it? Wherever your skin needs soothing!